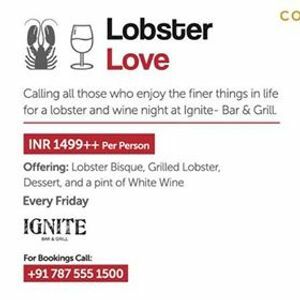 Inviting all sea-food lovers to a night of finely prepared 3-Course dining experience at Ignite Bar & Grill, celebrating Lobsters. Paired with a pint of fine White Wine, come indulge in a set-menu dinner priced at INR 1499++ only. (i) Charcoal Grilled Lobster (Choice of Marinations: Chermoula, Rechado, Jamaican jerk, Himalayan Timur, and Tandoori.